On June 26, 1862, Col. Montfort Sidney Stokes of the First Regiment, North Carolina State Troops, was mortally wounded in an engagement at Elyson’s Mill, Va. He died 11 days later in a Richmond hospital. 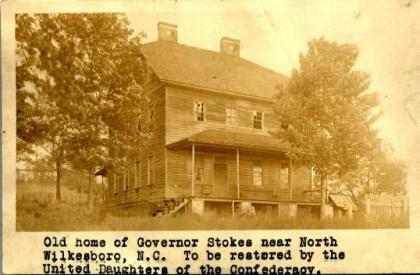 Stokes was born in Wilkes County in 1810. His grandfather had served with Gov. William Tryon during the Regulator rebellion, and his father was a major general during the War of 1812, governor of North Carolina from 1830 to 1832 and a U.S. Senator later. Stokes was appointed a midshipman in the Navy in 1829, training at the Norfolk Navy Yard and the Norfolk School. His naval career lasted 10 years before he returned to Wilkes County to become a farmer. After serving in the Mexican-American War, he returned to farming again, serving on the Council of State at the same time. At the outbreak of the Civil War, Stokes volunteered for the Wilkes Valley Guards and was chosen first lieutenant. He saw service at Goldsboro and in Virginia. Following his death, he was buried in the family cemetery on the banks of the Yadkin River.